I always found it to be a little ridiculous that my mother gave all three of her daughters the same middle name, or a variation of it: Mary. We are Kathleen Mary, Lisa Marie, and Laura Mary. With so many names to choose from, why so many Marys? As I prayed with today’s Gospel, Matthew 28:8-15, I laughed out loud as I read the first verse. “Mary Magdalene and the other Mary went away from the tomb, fearful yet overjoyed, and ran to announce the news to his disciples.” Did you catch that? The other Mary. Why so many Marys? Growing up, I really only knew about one Mary. The Mary. Our Blessed Mother. And it was not until my reversion to my Catholic faith that I discovered the gift of all those Marys; that blessed day of brokenness when I realized that life was not about getting over my mess so I could reach fulfillment, but rather, it was about resting smack in the middle of it, and allowing Jesus – the fulfillment – to meet me there. All those Marys taught me this. How blessed we are with this rich Catholic faith of ours, and the incredible examples of women witnesses that have journeyed this hard but beautiful life before us. Because I don’t know about you, but sometimes? Sometimes my mission as a woman just doesn’t feel like it is enough. Sometimes my role as woman feels a little bit “less than.” Sure, I can keep the house clean (of course, this all depends on what your definition of clean is) and I can get the kids off to school, and put in a load of laundry, and work a job, all while tending to broken pre-teen hearts, and encouraging weary souls, and praying in the quiet for my family, unceasingly. But at the end of the day, so much of what I do feels so incredibly unseen. So much of what I pour out, seems to go completely unnoticed. And so I often go to bed wondering, does anything I do truly make a difference? Does anything I give really matter? Do you ever do this? Do you ever reduce your role as mother, sister, daughter, friend, wife, woman, to an ordinary calling with no real value? Do you ever sit back and look at your life and fear that the mission you are on as a woman just doesn’t compare? That you can not possibly understand how rocking an inconsolable baby for hours, or driving your unenthusiastic child to religious education, or simply sitting and listening to your strong-willed teenager’s very different view of God, will ever earn you a part in the salvation story? Those nights I hold tight to my rosary beads and doubt there is purpose in my mission, I remember all those Marys. I close my eyes, and I place myself in their story. I sit on the edge of the bed with Mary, the angel Gabriel before us, and I learn to receive the message, to accept my Father’s will, to say “yes” to the unknown. I kneel down on the ground with Mary of Bethany, at the feet of my Lord, and I learn how to sit and be quiet; I learn how to listen, how to pour out everything I have because He is all that I need. And I run away from the tomb quickly with Mary Magdalene, learning that my sins are forgiven, my Savior has risen, and that He has blessed me, a woman, with the mission to announce this glorious news to the world. While the world’s instructions for women to prove their dignity and earn their freedom and joy are shouted out loud- go out and march, hold up a sign, use whatever language you want to make your point – all those Marys teach us so differently. Of course, if the cause is in line with what God asks of us, marching and sign-holding and using your voice is perfectly acceptable and greatly encouraged (you just might want to tweak that language a bit, especially if dignity is something you are after). But why we have come to believe that a woman who sits and listens and follows God’s will is passive and weak is beyond me and truly, a great tragedy. Maybe it is because we think nothing will get done if we sit still. Or maybe it is because we have waited for Jesus to show up in the past, and well, He never did. At least not in the way we expected. Or maybe we feel like all those “hidden victories” we accomplish each day count for nothing, if nobody but Jesus sees them. If that resonates with you, I encourage you to pick up a copy of Lisa Brenninkmeyer’s study, Discovering Our Dignity, and opening to chapter 20, Mary of Bethany. Known as the Mary who “chose the better part,” you might be surprised to learn that there were times in her life, just like in yours, when faith did not come so easily, when Jesus did not show up in time, when the pain was too much, when life was unsettling. How often we write off the great women in the Bible as ancient and unrelatable. How often we miss the fact that these women were heroic, that these women were strong, that these women were necessary, that these women are us. Last year I decided to use my middle name, Mary. No longer ridiculous, I now see the beautiful gift my mother gave me, naming me after all those Marys. And on this Easter Monday, it might be good for us to reflect on all these Marys. Just because we fasted for 40 days and the baskets were filled with goodies and eggs on Sunday, and we wore that Easter spring dress we bought despite the fact that there might still be snow on the ground…there is the chance that maybe we are not quite worthy of this celebration just yet. That maybe, we still have some stones in our hearts that need to be rolled away. Maybe we still have some sitting and listening to do. Maybe we have not yet poured everything out, so that we could be filled up with only Him, so that our homes permeate the sweet fragrance of a wild and boundless love. And if that is the case, that is okay. That is better than okay, actually. 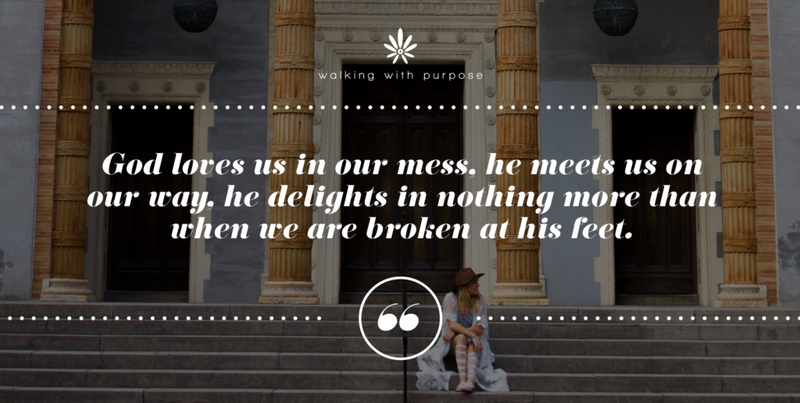 Because God loves us in our mess, He meets us on our way, He delights in nothing more than when we are broken at His feet. This, I learned, from all those Marys.